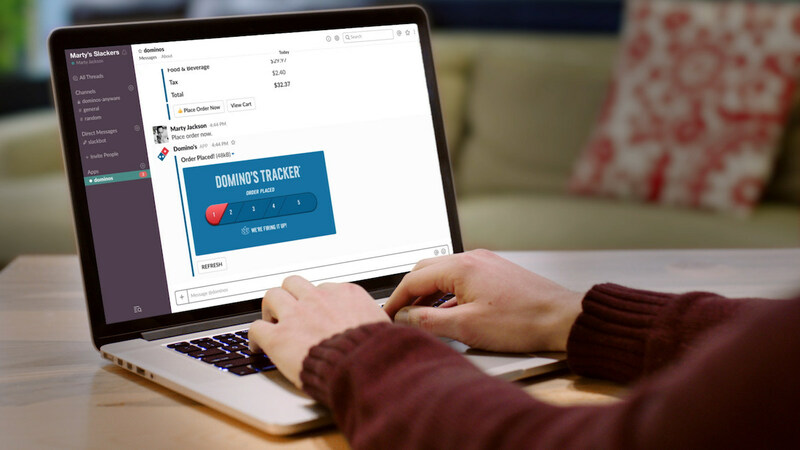 Pizza chain Domino's today announced integration with work-based chat platform Slack, introducing the ability for coworkers to talk about and order lunch all directly within Slack. After visiting the Slack App Directory, and installing the Domino's ordering app into a workspace, team members can begin discussing what they want to order from Domino's in a Slack channel. 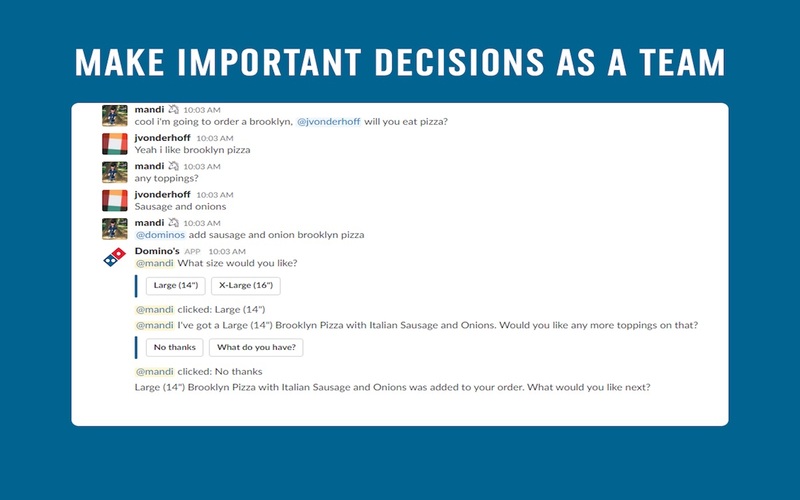 When the decision is made, members can call up Dom, the Domino's Slack bot, and specify crusts, toppings, sizes, and more. When the team is waiting for their food, a Domino's tracker will show what stages the pizza is in, from prep to delivery. Domino's knows that getting everyone in the office together to figure out the lunch order can be frustrating, so the recognized world leader in pizza delivery and digital ordering platforms is here to make it a little easier, thanks to the enterprise software platform Slack. Starting today, ordering a pizza lunch for that work meeting is as simple as having a quick group chat. "Collaboration on a big project can now carry over to collaborating on a team lunch order," said Dennis Maloney, Domino's senior vice president and chief digital officer. "We love to make ordering as easy and convenient as possible, and that includes ordering for the workplace. Now you can organize a group lunch with your coworkers down the hall, all from the comfort of your cubicle." Domino's has previously integrated with technology platforms, this past May announcing support for automation platform IFTTT and multiple connected smart home products. With this integration, Philips Hue bulbs can change colors when your Domino's order hits different stages, like lighting up blue when the pizza begins cooking at the restaurant. IFTTT even allows support for turning off the Rachio Smart Sprinkler system when an order is out for delivery (to prevent potential mishaps for the delivery person), and activating the Samsung POWERbot vacuum when the order is being prepped (to clean up for guests). In regards to the Slack integration, Domino's says it's the "first national pizza chain to offer group ordering on the platform." If your Slack team wants to try out Domino's order and delivery, download the app from the Slack App Directory here. To be honest, I can't quite see the appeal of this outside of a novelty value. Any device you can use slack on will also let you access the web or possibly a Domino's app. Having to figure out/remember the syntax the bot expects sounds more tiresome than just clicking some checkboxes. I think I finally have the ammunition I need to convince my boss to let us use slack at work. We use Slack at work and it is great. Really cuts down on email traffic while increasing communication and knowledge across the team.